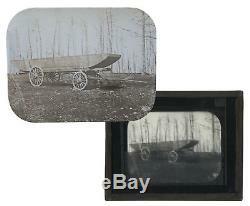 Civil War magic lantern slide, picturing a singular pontoon wagon and boat identified as belonging to the 50th New York Engineers at Rappahannock Station, Virginia in March 1864. Glass slide is from the collection of Taylor & Huntington of Hartford, Connecticut, a team of Civil War veterans who published slides in the late 19th century of images originally taken by Mathew Brady and Alexander Gardner. Image shows the numerous barren trees in the background, just starting to replenish leaves lost during the winter. Slide measures 4'' x 3.25'', cased in period metal. In very good condition with excellent photographic quality. The item "Civil War Magic Lantern Slide 50th New York Engineers" is in sale since Friday, November 17, 2017. This item is in the category "Collectibles\Militaria\Civil War (1861-65)\Original Period Items\Photographs".